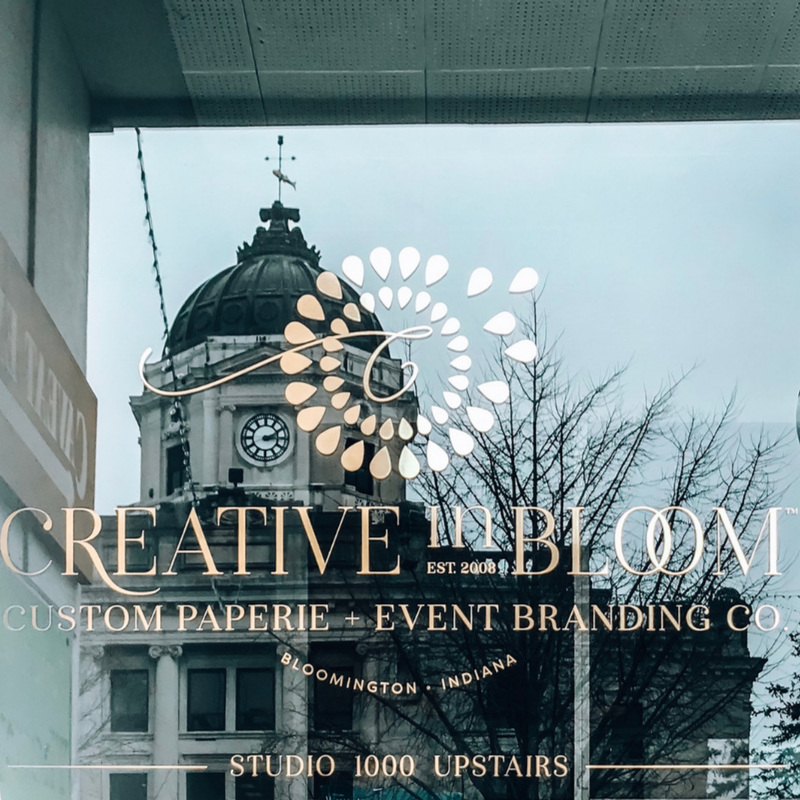 Creative in Bloom is an online custom paperie that provides paper goods, lettering services, products, and workshops, and specializes in event and business branding. Creative in Bloom is a one-stop-shop for all of your paper design needs, including: a unique event brand or graphic look that’s fit especially for you, memorable invitations, gorgeous ceremony signage and paper products, welcoming reception and party communications, and customized gifts. To ensure that your online shopping experience is a wonderful one, we offer a huge selection of products for all of your social and event communications. Browse a beautiful collection of pieces by award winning designer Christine Wilson, or shop with Carlson Craft, the nation’s oldest and most respected stationer around. If you want a personal touch, hand-lettered signage and signage rental is available through the site as well! Our foundation was built on providing custom creative services for event branding, styling, and communications, so we continue to offer the same premium service for one-of-a-kind events! Lets discuss your ideas, and we’ll create something designed specifically for you. While in-person consultations are the best way to get started, getting to know you via email, phone, or virtual consultation is just as good! Contact us today, and we’ll bring your vision to paper. Creative in Bloom is a Limited Liability Company. Christine Wilson, owner and artist, started Creative in Bloom, LLC in Bloomington, Indiana, Creative in Bloom has been specializing in custom stationary and design since its online launch in 2008. In 2012, the brand expanded their business by adding an Etsy store, and became a certified distributor of Carlson Craft in early 2014. Since then, they’ve launched their own collections, and carry licensed greeting cards with an outside distributor. Creative in Bloom, LLC employs occasional help with workload overflow. Graphic design interns and part-time production artists lend a hand with changes, assembly, and social media. All product development, artwork, design, and hand-lettering is done by owner and artist, Christine Wilson. Creative in Bloom, LLC is a stationery, and event decor brand based in Bloomington, Indiana. The brand officially launched via creativeinbloom.com in October 2008. In 2012, the brand expanded by adding an Etsy store and became a certified distributor of Carlson Craft in early 2014. In addition to the creation of our own collections, we have licensed greeting cards with an outside distributor. Creative in Bloom, LLC employs part-time help with work-load overflow for assembly. Graphic design interns and part-time production artists lend a hand with changes, assembly and social media. All product development, artwork, design and hand-lettering is done by owner and artist, Christy Wilson. Creative in Bloom's roots are in stationery and event details, but with continued growth, plans include developing more classes and an expansion of the product line. Creative in Bloom strongly believes in the gift of a handwritten card or note, and the sentiment that comes from heirloom quality invitations. Please let us know if there's anything we can assist you with or ways that we can improve your shopping experience.